If you’re a homeowner, now is the time to roll up your sleeves and tackle Spring projects around the home. Designated as Home Improvement Month, May is when you can take a good look at your home to determine what will be “we can tackle that” projects versus “let’s hire a professional” projects. If it’s time for improvements in your bathroom, you’ll need to decide if a professional plumber is needed or if you can handle upgrades on your own. 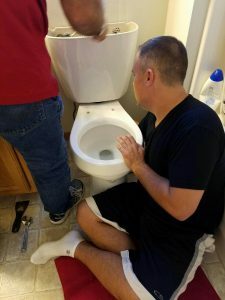 For some homeowners with a working knowledge of plumbing, replacing a toilet may be an easy-to-tackle project. If a new toilet is on your “must do” list during Home Improvement Month, we encourage you to check out the water efficient PROTECTOR® No-Overflow Toilet. This amazing toilet, which has a highly-engineered PuraCleanTM glaze for easy cleaning, features a unique concealed secondary drain that provides protection from messy overflow situations. Made in the U.S.A., the PROTECTOR solves the problem of clogged toilets displacing overflowing water onto the floor by redirecting excess water into the concealed secondary drain. There are no unsightly holes and the overflow system is hidden within the bowl. A homeowner’s dream toilet!